2. Write any two names of annual flowers. 4. Write the scientific name of rose. 7. What is permanent nursery? 8. What is nursery media? 9. What is clay pots? 14. Mention any four importance of floriculture in Nepal. 15. List out the principle of landscape design. 16. Describe two types of nursery in Nepal. 17. Write two uses of vermiculite. 18. Enlist the different pots used in nursery. 19. Write two advantages of hotbed. 20. What is vegetative propagation? 21. Mention the major challenges of floriculture in Nepal. 22. Describe the importance of garden. 23. Write on the following topics for marigold cultivation. (a) Variety (b) Soil (c) Climate (d) Manuring. 24. Write the importance of nursery. 25. Write the merits of propagation from seeds. 26. Describe two techniques of cutting with diagram. 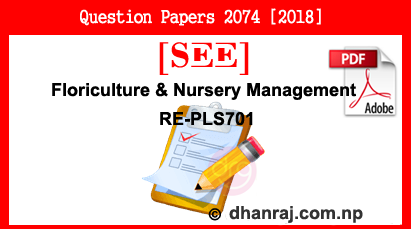 0 Response to "Floriculture And Nursery Management | Exam Paper | 2074  | RE-PLS701 | SEE"